Central Rappahannock Regional Library’s mission is to inspire lifelong learning for everyone in our community. Whether through our books, databases, or classes and events, we offer education paths for many different types of learners. I tend to learn best by listening, so one of my favorite methods of acquiring new information is through our Modern Scholar audio courses. The Modern Scholar series offers courses in a variety of subjects. Each compact disc set has 14 lectures, giving the instructors a chance to get in-depth on their topics. The best professors keep their talks breezy and engaging, and it is also quite apparent that they truly care about their subjects and enjoy teaching them - a factor that cannot be faked. I would like to recommend a couple of courses that I think make a great first impression for someone who would like to give The Modern Scholar a chance. They focus respectively on rock 'n' roll music and science fiction literature. Both explore their subjects' births and development, citing important contributions to the forms. Rock 'n' Roll and American Societyopens a new window is taught by William McKeen, and listeners can tell immediately that he adores his subject. In the first lecture, he instructs his listeners to simply say the words "rock 'n' roll" aloud. McKeen drawls the phrase, asking, "Doesn't that just sound great?" McKeen then dives into the roots of the genre, starting with blues great Robert Johnson. He also highlights lesser-known artists, such as Jelly Roll Morton and Professor Longhair. He offers a particularly funny anecdote about a post-Beatles Paul McCartney attempting to hire Longhair to play his birthday party. He then discusses how Muddy Waters and Chuck Berry pushed things forward by speeding up the music, adding electric guitars into the mix, and fusing African American blues with the mostly white genre of country-western. From there, we take off with Sun Studios and a man who only needs one name: Elvis. There are two Elvis lectures on here. For the sake of simplicity, you could call them the Thin and Fat lectures. The course then closes out with “The Day the Music Died,” and the plane crash that claimed Buddy Holly, The Big Bopper, and Richie Valens, leaving us with a snapshot of the state of rock music at the close of the Fifties. McKeen is at his best when telling anecdotes, from exploring the legend of Robert Johnson selling his soul at the Mississippi crossroads for his talent to explaining how an amplifier fell off the back of a truck on the way to Sun Studios and led to one of the first instances of guitar distortion on record. I do want to point out that Fredericksburg deserves its own stake of rock ‘n’ roll legend, when guitarist Link Wray simultaneously made up the instrumental “Rumble” and invented the power chord, the basis for all hard rock, at a sock hop in the early 1960’s I am so glad that McKeen's lecture series is listed as "Part One." His syllabus from his Boston University course hints at another volume, which would include the Beach Boys, the Beatles, Bob Dylan, and the Rolling Stones, with whom Muddy Waters played later in his career. When he came back to America, Waters was quoted as saying, "Those Englishmen want to play the blues so bad—and they play it...so bad." 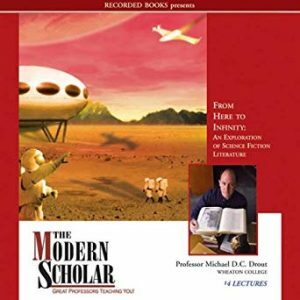 My absolute favorite course is Michael D.C. Drout's From Here to Infinityopens a new window, which thoroughly explores science fiction literature, suggesting both thought-provoking and reader-friendly titles. Droutopens a new window is Modern Scholar superstar with over a dozen courses recorded, mostly about literature and the English language. There is a reason why Drout has contributed so often. His voice is both soothing and positive. There is a gentleness to his words and a youthful enthusiasm as he explores entire universes of aliens, androids, and unfamiliar worlds. Starting two centuries prior with Mary Shelley's Frankenstein, Drout discusses the best, most popular, and weirdest novels and short stories of the genre. This course has given me hours of satisfaction because Drout's short summaries and analyses are both intriguing and encouraging. From the earnest spirit of Robert Heinleinopens a new window to the 1960s paranoid buzz of Philip K. Dickopens a new window to the hilarious "What the heck is going on here?" of Rudy Ruckeropens a new window, Drout's picks have fueled my reading list for the past decade. I do not always like every suggestion, but each broadens my understanding and appreciation of the genre. With almost 200 courses in the series, there really is something for everyone. Tap into our lifelong learning resources today with The Modern Scholar!